Combine the grated beetroot, milk and sugar in a heavy bottomed pan and cook on medium high heat, occasionally until the moisture evaporates almost completely and the carrots are tender, about 30-35 minutes. Then add in the ghee and mawa and stir to mix everything together. Then continue to cook on medium heat, stirring occasionally to make sure nothing sticks to the bottom of the pan. At some point the halwa will start to leave the sides of the pan completely and the fat will start oozing out. The carrots will almost glisten. Turn off the heat at this point and mix in the cardamom powder. Heat the 1 tbsp ghee or butter on low heat. Add the chopped dried nuts (except pistachios) and raisins and saute for about a minute, until the raisins plump up and the cashews start getting a nice golden hue. Pour this over the halwa and serve warm or at room temperature. 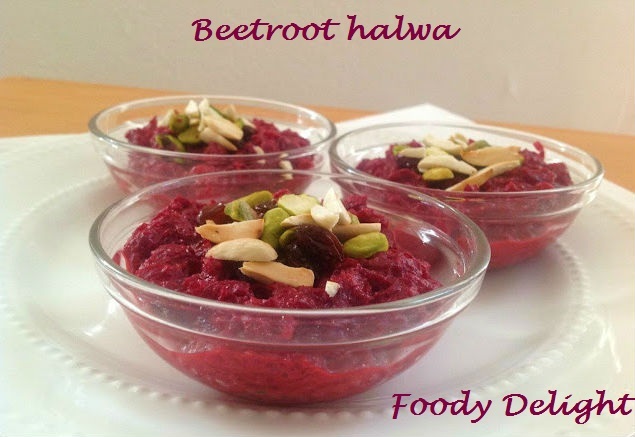 delicious halwa, i like beet only in this form. 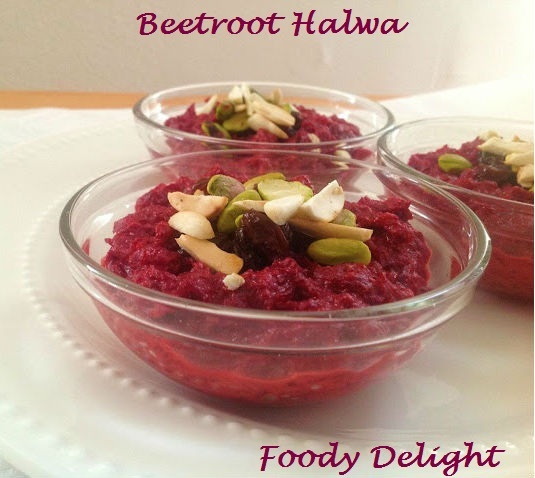 hi pranjali, your beetroot halwa looks so pretty- bookmarked with thanks. we have imported beetroots, what is mawa? is there another name for it. Yes, it's another name is khoya. You can also substitute khoya or mawa with ricotta cheese. Gives same result.